People disagree. It happens all the time, and it’s hard to know how to deal with disagreements. When it comes to family, politics and religion, the “Thanksgiving Rule” is to just not bring the topics up. But in an increasingly polarized world, we don’t always have the luxury of avoidance. In our personal lives, we need to build bridges over controversial topics. Professionally, we are going to encounter differing opinions, and how we deal with them can be a critical juncture in our career trajectory. Too often, a controversial topic triggers our “fight or flight” instincts. Instead, when entering into a conversation with someone where you know you disagree – perhaps vehemently – with their position, here are some ground rules it is worth explicitly setting at the beginning of the discussion. Too often, when we have a conversation or argument while the other person is talking, we are marshaling our counter-points instead of paying attention. By doing this, we miss critical information because we simply aren’t giving the other person the attention they deserve. If the goal is to have a productive conversation, we need to absorb the full measure of the other person’s words. Agreeing to listen attentively will benefit both the speaker and the listener. Empathy is about finding a connection with the other person. The actual definition of empathy is: the ability to understand and share the feelings of another. In a controversial conversation, it’s important to empathize and it’s also important to communicate that connection to the other person. Disagreements don’t happen unless both sides have some feelings about the issue. When feelings are involved, they can get hurt. Hurt feelings turn the conversation into a stand-in for the feelings instead of a discussion of the issue. Acknowledging the other person’s position through active listening, and a simple “I hear you, AND,” can go a long way towards diffusing tensions. When the topic is divisive, it’s hard to hear a perspective that is opposed to our own. But bear in mind, that is the same experience of the person on the other side of the discussion. The exchange will go much more smoothly if both sides commit to being respectful to one another. This means avoiding personal attacks, bringing up unrelated issues, interrupting, or raising your voice. When we feel respected, we are able to work through a topic without impacting the relationship. Agreeing to respect as a ground rule sets a productive tone for the exchange. Whether it’s a professional colleague or a family member, you likely will need to continue the relationship long after the disagreement has occurred. Go into the discussion with the understanding that the relationship needs to survive the conversation, and commit to communicating in a way that preserves instead of frays your connection. An overt commitment to the relationship is a great way to start a divisive conversation. It establishes a critical priority. The heat of the moment can be precarious in a disagreement. There is nothing wrong with pressing pause on the conversation to gather facts, to cool off, or to consider what has been said already. Taking a break from the discussion with a commitment to taking the topic back up again can give both sides an opportunity to absorb and review the conversation, and agreeing that it is a “pause” not a “stop” encourages us to think about ways to start back up again in a productive manner. When we address a topic with someone who holds a different view, the HUG principle should apply. Hear the other person. Understand what they are trying to say. Go forward together. 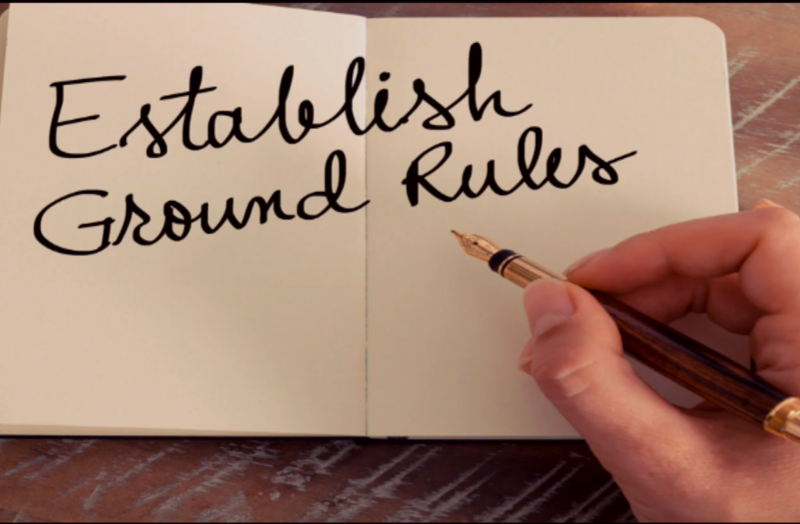 When we set ground rules, we are starting the conversation with an agreement. It may be the only agreement that comes out of the discussion, but the relationship will be preserved, and useful insights may be gained by following some civil guidelines.